Aramids; Gel-spun high-performance polyethylene fibres; Other high modulus-high tenacity (HM-HT) fibres; Carbon fibres; Glass fibres; Ceramic fibres; Chemically resistant fibres; Thermally resistant fibres. This important new handbook provides comprehensive coverage of how high performance fibres are designed and manufactured and covers their capabilities and applications. The high-modulus, high-tenacity (HM-HT) fibres fall naturally into three groups – polymer fibres such as aramids and polyethylene fibres; carbon fibres such as Kevlar; and inorganic fibres based on glass and ceramic fibres. 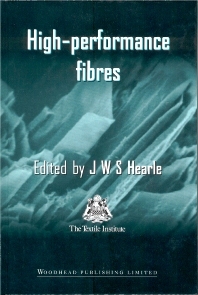 The books shows how high performance fibres are being increasingly used for a wide range of applications including goetextiles and geomembranes and for construction and civil engineering projects as well as in specialist fibres within composite materials where their ability to fulfil demanding roles makes them an effective choice for the engineer and materials scientist.